Here is a picture of one of my very favourite Williamson’s vehicles from when I was a child staying frequently in Bridlington. Williamson’s fleet could always be relied upon to provide a wide variety of real gems, and a particular fascination lay in the fact that only two buses were required at any time to operate the basic town services, and yet the fleet was always considerably more generous in size than seemed necessary. DV 4117 was a 1930 Leyland Lion LT1 which had been Devon General number 155. The well appointed body was by Hall Lewis, forerunners of Park Royal, and seated 32 passengers. I have to admit that, despite having such vivid memories of the vehicle, I cannot positively recall the entrance position. I have always had an idea that it had a rear door and also another one oddly set a little away from the front, but the photo shows no clear evidence of this and I may well be wrong. Any confirmation from a DG expert would be more than welcome. It was one of only a very few Williamson buses to carry fleet numbers and proudly sported number 24 on the front panel. In case anyone is impressed by the route number "11 AUX" I should explain that this was undoubtedly a Devon General remainder which presumably indicated a duplicate journey. The destination blind is quite magnificent, specifying the ultimate point and no less than four intermediate landmarks. This may not appear too remarkable until we consider that each of the two town services was only roughly one and a quarter miles in length !! In my later years, when I became more familiar with schedules compilation and economic programming on a grand scale I began to realise how very generous Wiliamson’s allocations were. The service to Old Town left Chapel Street at 00 and 30 minutes past the hour, took ten minutes to reach "Burlington" Market Place, stood for five minutes,and then returned to "The Quay" where a further five minutes could be had before the next departure. The Queensgate service ran to a similar pattern at 15 and 45 minutes past from Town. It is certain that both services could reasonably have been operated with just one vehicle and crew, thereby reducing costs by 50%. This could have been achieved by the bus leaving Old Town immediately on arrival and returning to Town via Queensgate – this would still have given five minutes recovery time in every half hour. This little theory of mine just demonstrates the World of difference between those leisurely civilised days and the current callous profit only orientated climate in the Bus Industry. Thank goodness for the former circumstances, or we should never have seen such wonderful fleets as abounded far and wide. Well Chris, my fascination with Williamson and WBS is kept well alive by this post. I remember the Lions, but had forgotten, or never knew from where they originated. Or was there only one? Many thanks John, and any such confirmation of the doorway/s in DV 4117 will be most welcome. Williamson’s had only one other Leyland LT1 Lion, with Leyland body, HD 3773 ex Yorkshire Woollen District – so Bridlington’s flat avenues will have made an easy retirement after the mountainous territory around Dewsbury !! The picture I have is of the batch of LT1s which started at 25, and these had front entrances. Glory Days – Devon General (p35) has a picture of 157 (DV 5119). An LT1/Hall Lewis, it clearly has two doorway configuration. p38 has a picture of a Park Royal coach from 21 -24, single door, but the caption refers to the new Park Royal’s first DG deliveries being of 20 LT2 with dual door bodywork. 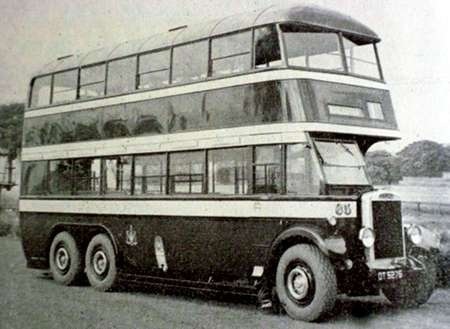 It leads one to believe the dual door was a DG standard at the time for service bus bodywork. When you look through the bus at the nearside windows, the second one is much narrower than the first and offside ones. It could well be the front entrance. A very good post, Chris. Many thanks indeed to John, David, and Chris H for such prompt and conclusive research into the doorway question. 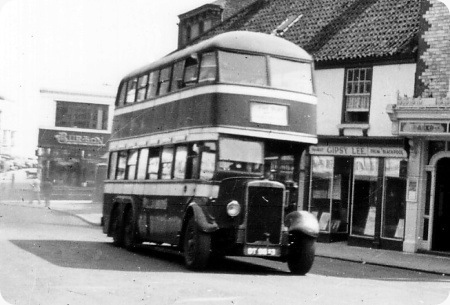 The bus, by the way is standing at the "weekday" terminus in Chapel Street, right outside the Methodist chapel. The stop pole was located in a "golf ball socket" in the pavement. As a mark of reverence which would not be found anywhere today, sadly, the pole was removed on Sundays to a similar socket in the pavement nearer to the Promenade junction. My mother who was in no way a bus enthusiast, other than from "A to B", must have become tired of my endless advices that DV 4117 was my favourite bus – and informed me that "DV" was Latin for "God Willing." I am attempting to put my recently acquired knowledge of Williamson, and White Bus Service into some sequence, time wise!. Thanks to Chris, I am now aware of several buses which operated for WBS and Williamson, but with the latter, who had such generous timetabling "freedom" how on earth did they manage to run such a large fleet? In the period I remember, about 1944 to 1950, Williamson had 2 Doncaster 6 wheelers, these Lions, and the 2 ex YWD TD2s. Were they all there at the same time? My memory is so mixed up! What would be the max. fleet strength at this period, and did they operate beyond QUAY and OLD TOWN? Also, did the Devon General Lion come direct, or via another operator, as I have a feeling these LT1s were withdrawn before WW2 broke out: ie; after a 10 year life span. I am no DG expert though, and would love to see some acquisition dates for this fascinating little fleet. I have a great deal of nostalgia and respect for EYMS, but what a pity they swallowed up these 2 delightful memory stimulators! You must have had hols in Brid at the same time as me Chris! Did you ever get to Morecambe, where more of my childhood memories took root? Several questions there John, and the answers are quite complicated. Pretty comprehensive fleet lists of Williamson’s and WBS appear in the PSV Circle East Yorkshire history and if you would like copies of these Peter will give you my E mail address. There were no less than five ex YWD TD2s, and the two ex Doncaster six wheel giants were the last buses bought by Williamson’s. They had only the two Bridlington local services – The Quay and Queensgate, and Old Town and The Quay – other than a very early but unprofitable foray (before our time I believe) to Flamborough. I have never actually holidayed in Morecambe, and have only visited for the day very occasionally. I cannot believe that I have just stumbled across this web-site. The times, not recently, that I have searched for Williamson’s Buses. The company was owned by my great grandfather, and latterly his brother. The family home was 1, West Street, Bridlington and I believe that they had premises on Quay Road and "The Black Shed" on Hilderthorpe Road (?). I understand that they started with horse drawn hansom cabs and then horse drawn buses. Apparently they kept a lot of horses on the fields that were then behind the West Street house. Jonathan – I’m so glad that you’ve been interested by this topic, and Williamson’s buses and those of the other Bridlington area operators were my life interest in the 1940s. The operating base was in Havelock Crescent in the final years – the premises still exist and are now a "Bosch" auto electrical concern. I have a cherished kindly letter from the last member of your family to run the business, regretting that he couldn’t help with any documents in answer to my appeal. 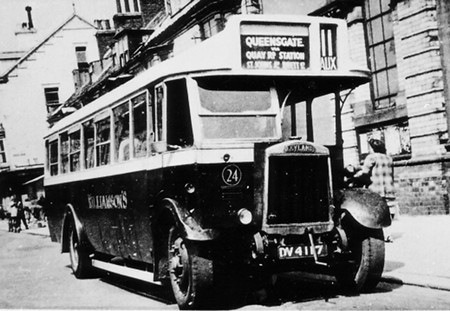 I’m so pleased to find this site and the photo of the Williamson bus. My Gt Gt Grandfather John Williamson was the founder of the bus company in the late 19th century. John had a large family and most of his sons were involved in the business. One had a livery stable, another was a horse dealer with the beach donkeys as a side line. My Father said the Williamson horses pulled the life-boat too. I have photos of the horse drawn buses if you are interested. Cathy Goldthorpe and Jonathan Williamsons. As the Williamsons blood runs through many veins on our side of the family not only in Goole, including Doncaster, Hessle, Castleford, Scunthorpe, Howden, Old Goole, Hull. Our side of the family was our mother Kathleen Williamsons who left Bridlington for Howden in the early 1930s along with her sister Mayvene who went to Doncaster. As children I can remember our yearly visit to Bridlington to visit our grandmother Eva at 28 Havelock Crescent with the garage opposite, my older brother and I would go into the garage to play on the Double Deckers Buses running up and down the stairs this was around the late 40s early 50s. Great Grandma Emma would visit us at Goole in her Car a Lincoln Zephyr, I was at the Bridlington library when Williamsons and the White Bus Companies was discussed I found the meeting we had was very entertaining I would like to thank the organisers for putting this show together thanks again. I see that my relations have got here first. I was living in 2 West St as a child and was brought up on tales of Robert and Reuben Williamson, the horse buses and the White Bus co.. Nice to see all the information here. Bit late arriving back to look here but thank you for the comments about the Library day, it was I who did the talk, after finishing the prep for Dad’s second book. I hope the library is able to do another one some time, I would love to go. I think I have possibly found a photo amongst those given to my dad by one of the elder Williamsons, showing the Lincoln Zephyr you mention! Here is the picture of Williamson’s ex Doncaster Titanic (76 – DT 9643) in action in Queen Street. Unfortunately the destination blind is obscured by the sun but would say either "The Quay and Queensgate" or "Old Town and The Quay", depending on whether it was quarter to or quarter past the hour, or on the hour or half past. It was a 1938 Titanic TT5c and served only one year in Bridlington, from July 1949 to July 1950. Possibly its Titanic running costs, maybe aggravated by the torque converter, resulted in this short career. In view of the notorious maritime disaster of 1912 I’ve always thought it either brave or cavalier of Leyland to give the model this particular name !! Slightly off our normal bus subject – hard labour of a the non driving sort. In Nov 1907 a man called Arthur —- was charged on remand with stealing the tin box containing the fares collected on one of the ‘busses plying between Old Town and the Quay (note the old plural spelling for buses) the thief got 2 months hard labour – obviously not soft on crime in Bridlington! Doncaster had nine Titanics, some of which were passed to other operators – one even ending up with Yorkshire Traction. Some lasted until the early 1950s. Sheffield’s Titanics had a reputation for poor-hill climbing, and I believe they were used mostly on the relatively flat 57 route to Stocksbridge. Geoff – I believe Sheffield’s Titanics were known as ‘Dragonflies’ on account that they would ‘drag’ themselves slowly up the hill and ‘fly’ down the other side! I recently came across this picture of Doncaster’s "Titanic" No 65. This was evidently taken outside the Charles H.Roe works prior to delivery. According to the accompanying text "It seems likely that this imposing bus was the only TT2 Titanic other than the three supplied to City and taken over by the L.P.T.B., of which the chassis numbers were 2288-90". These might not have been the earliest Titanics, for I have a feeling that I once saw a photo of a Western SMT TT1 Titanic which dated back to about 1928. So they were in the catalogue for a long time, even if they only sold in penny numbers. I know I’ve mentioned this before, but whatever were Leyland thinking of to use this model name when you consider the appalling shipping disaster of 1912 ?? Perhaps level headed operators paid no heed to this, but who knows if the insensitive name played perhaps just a little part in the low sales achieved?? Yes, Chris – it is indeed strange that they used the name Titanic so soon after the tragedy, but I suppose the then more recent Great War memories made this event almost trivial in comparison. However, I find it strange that, today, the Titanic disaster has become something almost to be "celebrated" as in Belfast. Sorry – not a bus related comment. However, it’s good to know that the AEC equivalent had a more positive and inspiring name – Renown, albeit with the same poor sales. Of course, it was LGOC/LPTB who boosted the otherwise meagre sales of the pre-war AEC Renown; 1488 LT’s and 22 LTC’s, plus the true coach taken onboard from Edward Hillman (LT1489). The only other ones that readily come to my mind are the 25 bought by Leicester Corporation in 1939-40. As for the Titanic, the WWI torpedoing of the Lusitania might have made the Titanic sink into the background of folks memories. I’ve just realised the Freudian slip, but will leave it as an example of the way the mind innocently works at times! As an aside, I’ve only ever seen photos of Leicester’s Northern Counties-bodied Renowns (one preserved)- I assume that the MCCW versions were a different design. The famous Mr Rackham – who designed both the Leyland Titan and the AEC Regent – was vociferous in his dislike of what we now call tri-axle designs and disapproved of the LTs. Leicester’s MCCW Renowns were specifically delivered to a Northern Counties like outline to make all the Renowns look similar. Williamsons was Doncaster 76 a TT5c new in 1938 withdrawn in 1949. What a huge difference in appearance over 4 years. 76 would pass for a post war bus, but 65 looks almost 20’s. My grandmother Doris was Ruben Williamson daughter, who married Samuel Bolton & lived across the road from the garage at 22 Havelock Crescent & my dad often told me about Williamson buses when he was 14 before school he used to help his dad Samuel bring the buses out (abo 1935).